This eco friendly units has a private outdoor areas with hot tub, parking, Wifi, full Directv package, beach cruisers, boogie boards, beach chairs, and outdoor grill. It also has hypo allogenic foam mattresses, flat screen televisions, full kitchens, and washer/dryers. 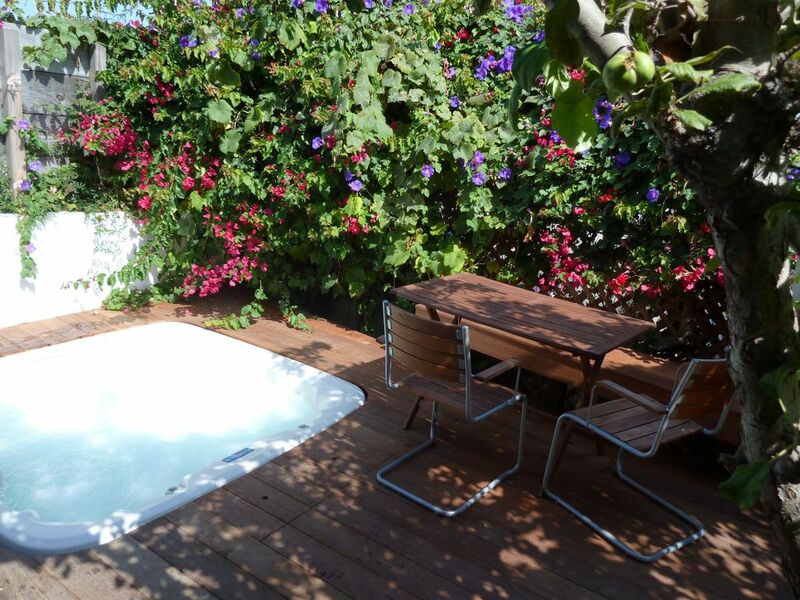 This property is a private bungalow in the best location in Venice Beach. It is walking distance from the two best shopping and entertainment streets on the west side of Los Angeles- Abbot Kinney Boulevard in Venice, and Main Street in Santa Monica. Both streets offer a multitude of restaurants, shopping, antiques, pubs and other entertainment, all close by. Also close by is the beach, with the famous Venice Boardwalk to the south, and the Santa Monica Pier to the north. To the east, Whole Foods Market, the neighborhood breakfast place, Flake, the Venice Beach Wine Bar, and more restaurants are a just short walk away. Because there is no place like Venice, and to truly experience it you must live like a local (not stay in a hotel). There is an energy and excitement in our neighborhood that is unparalleled. A vibrant cultural, art, music and culinary scene makes Venice a great place to live and vacation. Adorable cozy place, great location! Stayed with one adult and two children. Perfect size and location for our small party. Hot tub was a wonderful end to our busy days. John was very responsive when we had a few questions. Loved our stay, thanks so much, John! Clean, great location, ambiance was adorable! Had an awesome night at this little gem! Super close to the beach and lots of outdoor area to hang out! Amazing location-so close to the beach! Wonderful quirky bungalow 3 blocks from Venice Beach. The hot tub was a life saver after walking for miles at Disney and Universal Studios. Walked to Santa Monica Pier right on the ocean. Even saw dolphins! Yes, there is a homeless encampment right across the street, but not once did anyone approach us for spare change. Much better than here in Seattle. Would I stay there again? Definitely!!! Pros great location. Walking distance to whole foods And restaurants. A quick little bike ride down to the beach. There's a great little breakfast restaurant right out the street on the left hand side going east bound. The avocado toast was really really good. The bed was comfortable and thank God we had a fan it was very warm.. Can't comment about the hot tub since we didn't use it. Parking on the street was available as well as the dedicated site behind the house. The little porch area was very nice with colorful flowers hummingbirds and it was very secluded even though we are on a busy street. The 1st night we were there were some homeless people on the corner making a big commotion police fire dept came ...lots of yelling, it was a little bit unnerving. The bikes had something to be desired and you need an Allen wrench to raise the seats as well as the handlebars but I was able to find a garage to fix everything.we had fun biking the beach. All rentals should have martini glasses. The living room couch needed some help. Overall we had fun and would recommend for a couple that's not too particular but enjoy venice area and the vibe. Truly in the heart of where you need to be in Venice. Easy walk to the beach, great restaurants and fun to people watch. Perfect for families or if you want to go as a couple..
Other Activities: Private massage, Private Cooking Classes, Private Jewelry Making lessons, Private Surf lessons can all be arranged with advanced notice.